Three (3) Function Modes: Continuous, Modulate and Burst. Timer: 30-minutes,60 minutes and continuous. Channels: Dual, isolated between channels. Pulse Amplitude: Adjustable 0-80mA peak into 500 ohm load each channel, constant current. Pulse Width: 40μs - 260μs adjustable. • B: Cycle Bursts, 2 Bursts/sec, 9 pulses/Burst, 100Hz, width is adjustable. • C: Continuous mode. Pulse rate, pulse width and intensity are adjustable. • M: Modulated Width. Pulse width is automatically varied in an interval of 6 seconds. The modulation range of pulse width is from setting value to 35% less than the control setting value, then returns to the setting value. Rate, width and intensity are fully adjustable. Timer: 30, 60 minute and continuous mode selectable. Maximum Charge: 21 micro coulombs per pulse. Power Source: 9 volt alkaline battery or similar rechargeable cell. Battery Life: 70 hours average usage (alkaline). Size: 95 mm(H) 61.5mm(W) 26m(T). Weight: Approx. 120grams (battery included). All values have 10% +/- tolerance. TENS/EMS Units & Stimulators can be found in our extensive online collection of products from globally recognized and trusted brands, including ProMed Specialties. 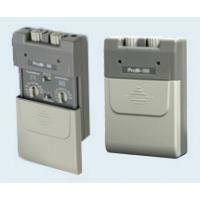 An excellent option to consider is the ProMed TENS Unit, Dual Channel.